Lightning peels across the sky north of our home in Byng, Oklahoma last night, in this image made with my 20mm f/2.8 lens showing our front yard. Two rounds of thunderstorms rolled through our home in Byng, Oklahoma last night. The first one skirted us to the north, so from our point of view, we had an excellent view of the right flank of the storm. It was the first time in the last couple of years that all the factors came together for me to make good lightning photos: little or no rain at my site, a very electrically-active thunderstorm, a lack of obscuring rain on my side of the storm, and no danger of being struck by lightning. 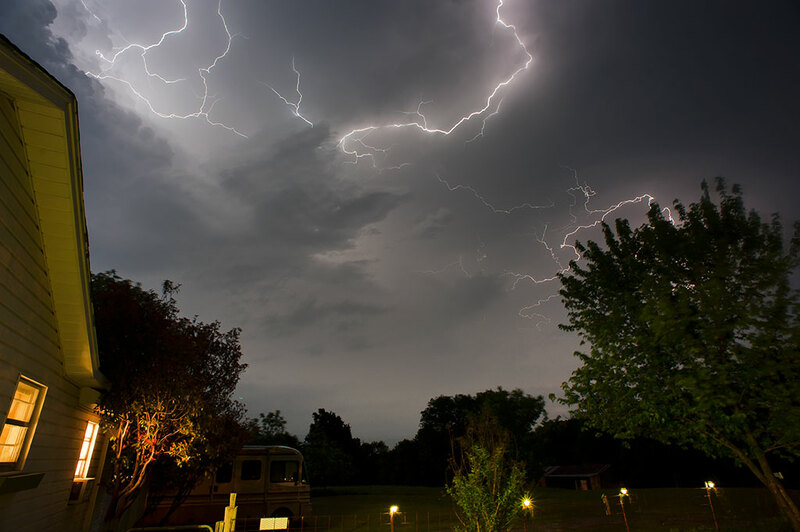 Years ago I was standing in my garage trying to photograph lightning when a bolt hit a tree across the pasture. Not only was it insanely loud and bright, a feeder of it made it to the garage. I was leaning on the metal door track at the time, and electricity passed through it into my right arm. I was lucky I wasn’t injured or even killed. Last night my wife and I saw and heard an approaching thunderstorm. At first I went out onto the back deck, but only made a few frames there and decided the storm, moving from my left to right looking north, was about to be hidden by the house, so I relocated to the front deck. At that point, the patience plays a big role. 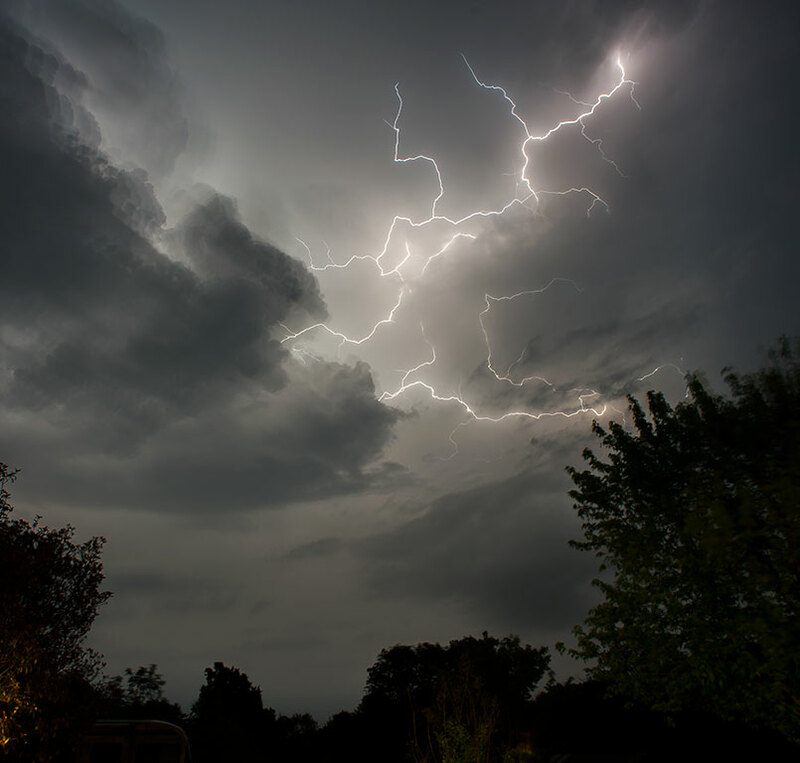 Unlike fireworks, traffic, or Christmas parades (all of which are photographing lights) thunderstorms are irregular and unpredictable, so by the time you get set up, it could be too late, or the timing could be just right. Last night was such a “just right” night. Also worth noting are the clouds in this image, particularly in the upper left corner, which appear to repeat. 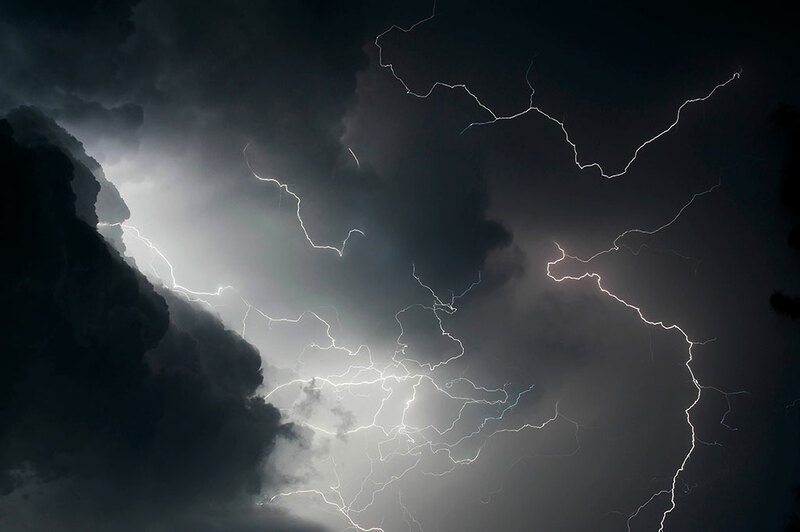 This is caused by swiftly-moving clouds that are invisible to the camera until they are illuminated by repeated lightning strikes. Within five minutes I felt the storm had moved away from me sufficiently to warrant switching to a 50mm lens, and I felt I wanted a slightly darker product than I was seeing on the monitor, so I changed to f/11 at 30 seconds. The 50mm filled the frame with the densest part of the lightning, and I felt several images looked good. At 30 seconds, this image is an aggregation of a number of lightning strikes. 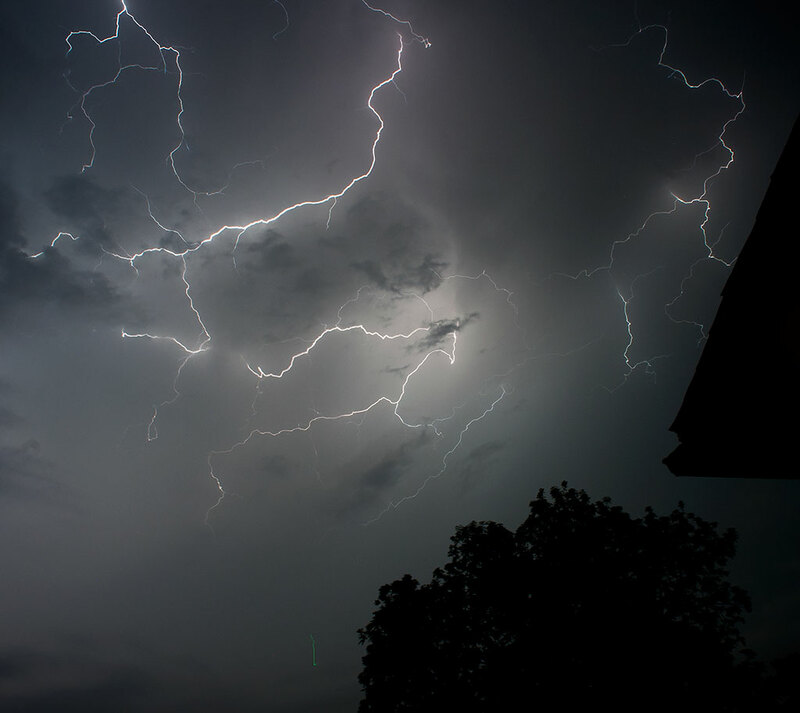 Made with my 50mm, the view angle was about right for this storm, and I was very pleased with this image. Now THIS is photography. Thanks for the camera and lens settings, I have always wanted to know how to capture these kinds of images. It really does seem like a combination of preparedness and sheer luck. Great pictures. This is one of your best entries. I’ll have to save this one for future reference, though it’s possible I’ll just commit the specs to memory! Great shooting. Amazing. And, yes, thank you for the tips. I never knew you were tangentially struck by lightning. Excellent points.